I am looking for prayer warriors. This is not an easy task. Satan will do everything he can to keep you from doing this, but I need at least 13 people who will pray for a specific assigned area of National Conference. We have 13 areas we want to bathe in prayer leading up to National Conference. Pray at least once a week between now and June 17 prayer. Requests will be updated at least every other week. Pray daily from June 18-25 for your specific area. To be assigned as a prayer warrior, email gary@ub.org and you will be assigned an area of prayer to prepare for a spiritually uplifting and challenging National Conference. Here is a short news report by HTV, the student-run Huntington University TV station, about the section of Dr. Sherilyn Emberton as the new university president. Mark Ralph (right) has been assigned as senior pastor of Mount Zion UB church in Wayne, Ohio. In September 2012 he began a one-year assignment as interim pastor. Since that time the church leadership has met periodically with Bishop Phil Whipple, and has determined to appoint him as senior pastor, effective immediately. The annual UB Youth Workers Summit began today in Daytona, Fla. Bishop Phil Whipple is there, along with about 25 youth workers from United Brethren churches. They’ll meet through Thursday, May 2. The keynote speaker is Arthur Wilson, campus pastor at Huntington University. Blair Caldwell, a student reporter with HTV, the Huntington University student-run TV station, conducted this short interview with Dr. Sherilyn Emberton, who will become the new college president on June 1. Last week, the Huntington University board of trustees approved launching graduate-level–both masters and doctorate–programs in occupational therapy as early as fall of 2014. This will be the university’s first doctorate-level degree. The graduate programs will be located within the new Life Science Education and Research Consortium of Northeast Indiana at the Parkview Randallia campus in Fort Wayne. The programs will build on Huntington’s undergraduate degrees in exercise science, nursing, and allied health. The program has received a high-level of interest, with more than 50 inquiries from prospective students. Through the consortium, the university is currently offering bachelor’s degree programs in human resource management, not-for-profit leadership, and RN to BSN degree completion, as well as a Master of Counseling program. The Huntington University Board of Trustees approved a proposal to create a campus in Peoria, Ariz. (the greater Phoenix area). The city of Peoria will vote on it later this spring. The campus could open as early as spring of 2014. 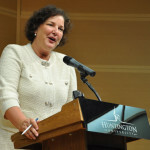 In October 2012, Huntington University entered into a 180-day exclusive negotiating agreement with the Peoria to begin talks of what a potential branch campus could mean for both entities. Since then, university administrators have met with city officials to determine location, programs, and funding sources. The campus would feature programs such as digital media arts, exercise science, nursing, ministry and missions, education, and counseling psychology. Two other institutions, Trine University of Angola, Ind., and St. Scholastica College of Duluth, Minn., are also planning to offer degree programs in Peoria. Each university would offer different academic majors to students based on its unique institutional strengths. The Huntington campus will look to attract students who are seeking a Christ-centered, professionally sound, and community connected education. The campus will also offer the opportunity for students at the Huntington campus to study in Arizona for full semesters or for shorter term classes. Bishop Phil and Sandy Whipple at a Huntington University reception for Dr. Sherilyn Emberton. “Dr. 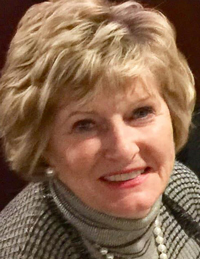 Emberton will be a very good president for us,” Bishop Phil Whipple said about Dr. Sherilyn Emberton, the next president of Huntington University. Bishop Whipple was part of the 14-member Presidential Advisory Task Force which conducted most of the search process. The group included nine Board of Trustees members and five faculty or staff of the university. One other United Brethren minister was part of that group: Gary Dilley, senior pastor of College Park UB church in Huntington, Ind. Former bishop Paul Hirschy coordinated prayer efforts for the process. Dr. Emberton speaking at the introductory press conference on Friday afternoon, April 26. They hired Carter-Baldwin Executive Search, a firm which has helped fill positions at other Christian colleges as well as at major corporations. The managing partner, Price Harding, spearheaded the search efforts. “Price Harding did a remarkable job,” said Bishop Whipple. “He’s a first-class Christian gentlemen who led us well in the whole search process. It made it easy for the team to wade through a lot of information. The task force members spent two days in Indianapolis interviewing the four finalists, two persons each day. “I was really wowed by Dr. Emberton in Indianapolis,” said Bishop Whipple. “We saw two people the first day, and she stood out—and continued to stand out—as a star. She speaks with a lot of confidence, and has clear leadership gifts. I wondered how I would feel about her when I saw her again, but there was no change. She was the same kind of person I saw in Indianapolis. Those 14 persons did an initial vote, and 13 of them identified Dr. Emberton as their first choice. The other person listed her second, but was perfectly willing to go along with the group. So when the advisory task force gave their final vote, it was unanimous. And when the Board of Trustees voted on April 26, it, too, was unanimous. 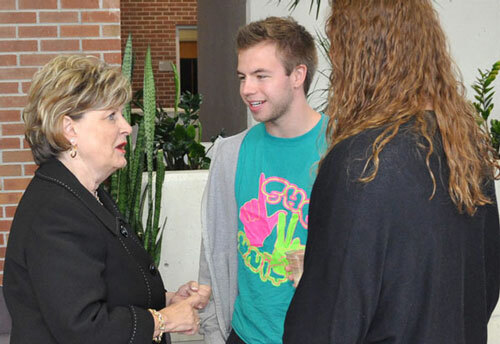 Dr. Sherilyn Emberton with Huntington University students at a reception on April 26. 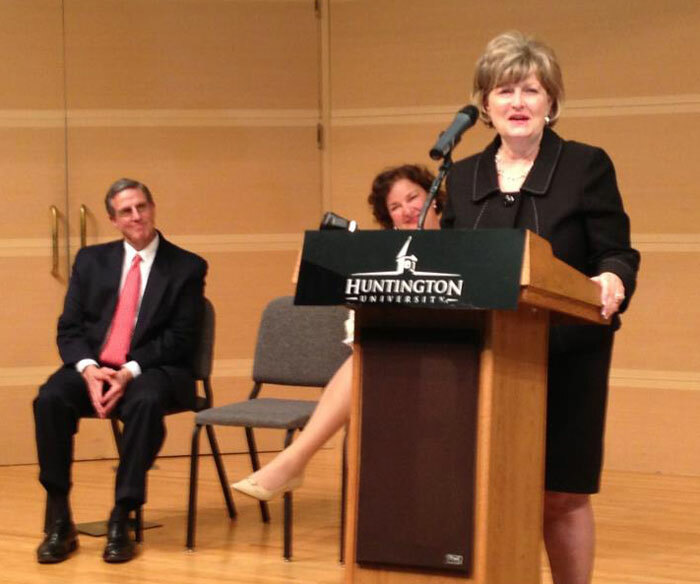 “Today is a great day to become a Forester,” said Dr. Sherilyn Emberton upon being introduced as the next president of Huntington University. 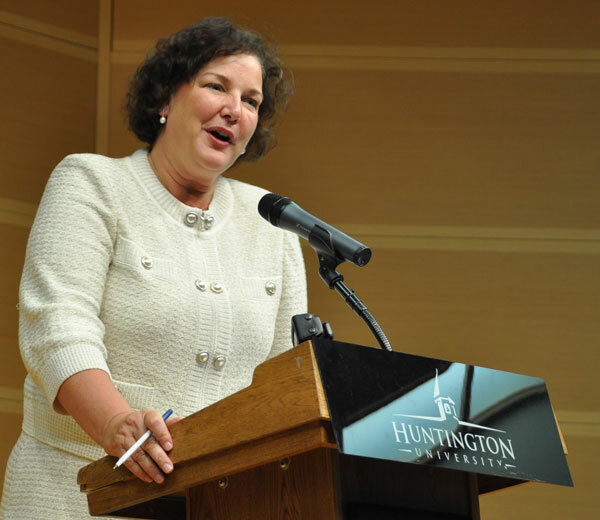 On April 26, Dr. Emberton was chosen by the Huntington University Board of Trustees to be its 13th president–and the first female president in the school’s 116-year history. Dr. Pemberton will assume that role on June 1. Dr. G. Blair Dowden, the president for the past 22 years, will retire on May 31. Dr. Emberton is currently provost and vice president for academic affairs at East Texas Baptist University in Marshall, Texas (in east Texas near the Louisiana border). East Texas Baptist is a private Christian liberal arts college which mostly serves the tri-state area of Texas, Louisiana, and Arkansas. With 1200 students, it’s about the size of Huntington University. And it’s a denominational college, so she’s familiar with those dynamics. Emberton brings a great deal of experience in program development and fundraising. Also, she has had significant experience with multi-site campuses. This will prove valuable as Huntington University launches a satellite campus in Peoria, Ariz.–another of the momentous decisions made this week by the Board of Trustees. Dr. Emberton is a highly-gifted leader with extensive higher education administrative experience, including positions at public, private, and faith-based institutions,” said Kelly Savage, board chair. At a press conference on Friday afternoon, Savage pointed out various qualities. Emberton has extensive experience in academic program development, having launched graduate programs in counseling, education, law, medicine, religion, and sports leadership. She was born in Irving, Texas, and brings to Indiana enough of a drawl to confirm that she’s a Texan. She is a lifelong Christian. She currently attends First Baptist Church in Hallsville, Texas. She is described as a great listener with a collegial attitude. She has always championed literacy efforts and would want to get involved with that in some way. She has a soft spot in her heart for community theater. 1979: Bachelor of Science in Education from Stephen F. Austin State University. 1981: Master of Education from Stephen F. Austin State University. 1999: Doctor of Education from Texas A&M University-Commerce. 2010 – Present. Provost and vice president for academic affairs at East Texas Baptist University in Marshall, Texas. 2007-2010. Provost and vice president for academic affairs at Lincoln Memorial University in Harrogate, Tenn. At Lincoln, a secular liberal arts school with an enrollment of over 4300 students, she gave oversight to seven academic schools and 12 off-campus sites in three states, managing an annual budget of $30 million. She instituted offering doctoral degrees in medicine, education, and law, along with professional programs in other health-related fields. She also opened four new off-campus sites in Kentucky and Tennessee. 1999-2007. 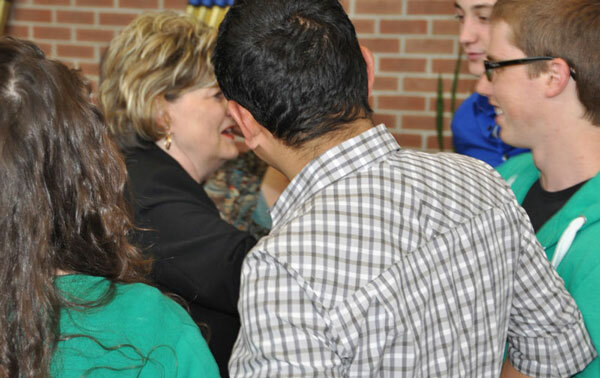 After completing her doctorate, Emberton was hired by LeTourneau University in Longview, Texas, to lead its new teacher education program. 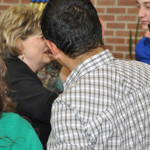 In 2001 she became LeTourneau’s Dean of the School of Education, and in 2005 added the title of Associate Vice President for Academic Affairs. LeTourneau is a Christ-centered university with 2800+ students. 1996-1999. Emberton was Project Director for Applied Learning at Texas State Technical College in Marshall, Texas. This is a public, two-year technical college. 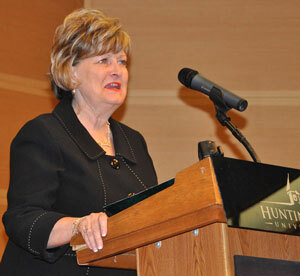 Kelly Savage, chairperson of the HU Board of Trustees, introducing Dr. Sherilyn Emberton. 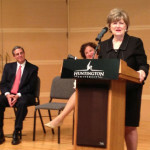 Dr. Emberton speaking at the press conference, as Dr. G. Blair Dowden and HU Board of Trustees chair Shelly Savage listen. Dr. Emberton with HU students. Dr. G. Blair and Chris Dowden at the April 25 recognition by the HU Board of Trustees. 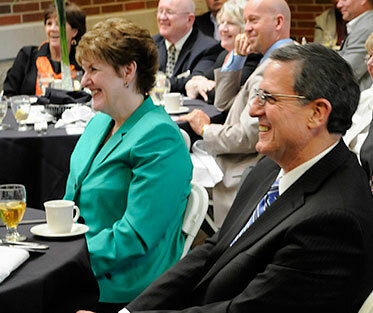 The Huntington University Science Hall, which opened in 2002, has a new name: the Dowden Science Hall, in honor of Dr. G. Blair Dowden, who will retire on May 31 after 22 years as president of the university. 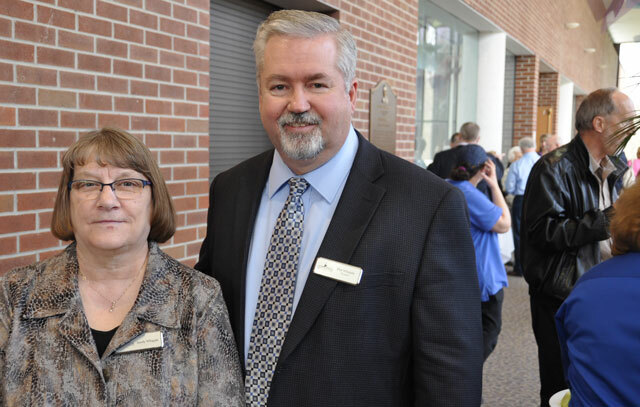 The renaming came Thursday night, April 25, during a special ceremony. Both Dr. and Mrs. Dowden were also named President Emeritus and First Lady Emerita, respectively, by the Board of Trustees. “We will remember the two of you and will be forever grateful,” said Dr. C. Ray Miller, former UB bishop and former chairman of the HU Board of Trustees. The state-of-the-art Dowden Science Hall is home to the university’s programs in nursing, mathematics, computer science, physics, chemistry, biology, pre-med, and environmental science. It is the most significant building project to occur during Dr. Dowden’s presidency, which began in 1991.